Heraclitus (535 – 475 BCE) is considered as the first Western philosopher dealing with moral issues, with Lao-tzu in the East as his contemporary moral philosopher. 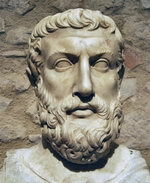 Heraclitus looks for the principle of changes – everything changes, but the law of changes does not change. In light of our model, many of his statements can be coherently understood. It is also the first treatise in the West on the principle of human conduct based on observations on nature. He calls the principle the Logos, as the universal order of the changes in the universe. Logos is the principle that holds all things together as unity despite of continual changes. This is essentially our “Principle of Oneness.” The proper way for us to seek the truth is to follow this Logos. For Heraclitus’ fragments, we choose the translations of Freeman [FR48] as main reference.